Have you decided that it is time for your little one to attend preschool? Are you ready to become acquainted with new friends, fun activities and wonderful teachers? Are you a little bit anxious about saying goodbye to your child? Here I have summarized some suggestions to help you and your child on your first day of preschool. Feel free to add or change the steps to help your child feel most comfortable during his/her first day at preschool. 1. Visit the preschool with your child before the first day. 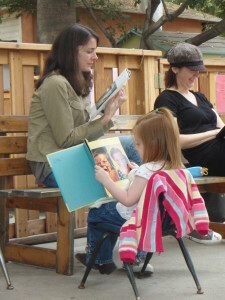 Visiting the preschool is a great opportunity to introduce the environment and teachers. Knowing where you are going can take a lot of stress away from your child and you. 2. Take a picture of your child together with his or her teacher. 3. Arrange a play date with one of the children in his/her group (class lists are often available). Knowing one of the peers ahead of time can make the transition easier. 4. Read a book related to first day of preschool or create your own. 5. Prepare your child by drawing a simple picture of what will happen during school time and when you pick him/her up. For example: “Tomorrow we will go to your new preschool. There will be children to play with and teacher Ms. Susana. Remember we met her when we visited the preschool? 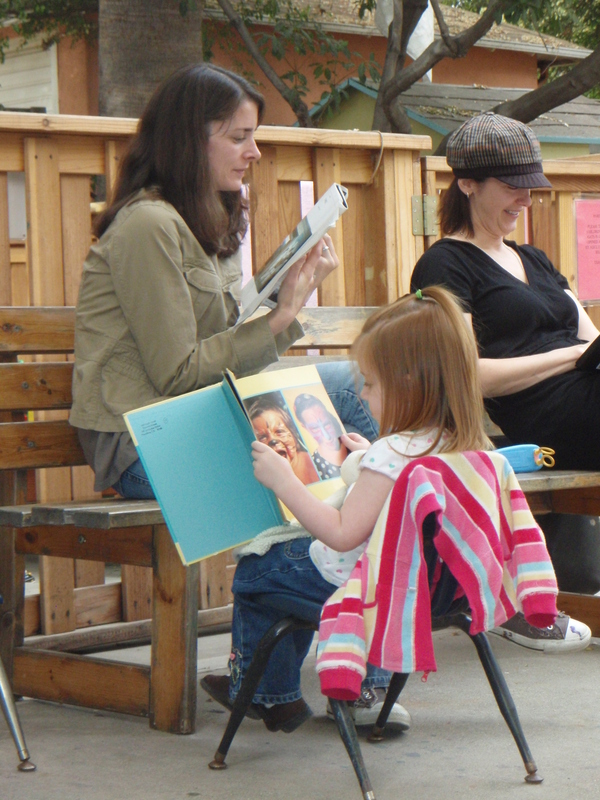 First you will get to play, and then Ms. Susana will read a story and sing songs with you. When the story ends you will have a snack. After Snack Time it will be time to go outside and then time to go home. I will pick you up when you will be playing outside. If you plan to stay the entire day at school, let your child know. 6. It is great if you can bring a special toy or “blankie” to school. They can help a child feel more secure. Also you can place a few family pictures in her/his cubby or backpack. .1. Once you arrive, play with your child for 5-15 minutes. Let your child know that you will stay for x number of minutes. During this time, the message must be clear about your intentions: do not play with your car keys or pick up your purse while engaging with your child. 2. Never sneak out!! Your child will not forget about you, so leaving without saying goodbye will not ease the transition. Instead it could create a much more challenging departure in the future. Remember you are building trust! 3. Make eye contact with the teacher. See if he or she is available. When the teacher joins you at the activity, let the teacher and your child know that you will be leaving in 5 minutes and state the time you plan to return. 4. Be consistent: leave promptly after you said you were leaving. If parents’ seem unsure and worry, the child will feel it. Your child might react to your statement of “I’m leaving” by clinging to you or crying…it is important that you comfort your child by saying “I hear you, I will return at x time to pick you up, you will stay with Ms. Susana. 5. Develop a goodbye ritual. Your child and teacher may choose to walk you to the door or gate; however, your child can stay with his/her activity and say goodbye from there. Children often find comfort in developing a ritual when saying goodbye. This might include their parent pushing them on the swing for 5 minutes, reading a story together, or two kisses and two hugs, etc. Agree on a procedure and then stick to it. Or you might already have your own ritual. 1. Make sure you return on time. This is a wonderful opportunity to build trust. 2. Have a relaxing time after preschool. Your child might be overwhelmed for a few weeks to months after starting school, don’t plan other activities for your child, so she/he and you can process the information and emotions related to starting a school. 3. Listen To – what your child might want to tell you about his/her new experiences. Try not to judge or tell your child how he should feel or do instead. 4. Create a book about this event and read together before going to bed.Separation is a lifelong process. Separation anxiety is a natural part of child development. Children learn that even though mom or dad say “goodbye,” they will come back. Children learn to trust another adult in their lives. Parents learn to trust that teachers care for the safety and well-being of every child. Parents learn to “let go” and allow their child some autonomy. Learning to successfully separate from their parent and settle into their peer group is often a major focus of the first few months of preschool.